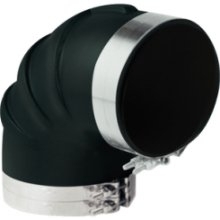 Trident Rubber Elbows provide ultimate flexible connectors for Marine Wet Exhaust Systems. They offer much greater tolerance to heat, misalignment, engine movement and vibration, with significant savings in cost, parts, labor and space. Highest max. continuous operating temps - 280ºF (138ºC). Exceeds (SAE J2006-R3, and ABYC & NMMA P1) Std. 2.00 4.50 5.50 2.00 1.75 2.00 0.20 1-7/8" to 2" 1-1/4" to 2"
2.50 4.25 4.25 1.75 1.75 2.00 0.20 2-3/8" to 2-1/2" 2-3/8" to 3"
3.00 5.25 5.25 1.75 1.50 2.00 0.25 2-7/8" to 3-1/4" 2-3/8" to 3"
3.50 5.50 5.50 1.75 1.50 2.00 0.25 3-1/2" 2-3/4" to 3-1/4"
4.00 5.75 5.75 1.75 1.50 2.00 0.25 4" 2-1/4" to 3-1/2"
4.50 6.00 6.00 1.75 1.50 1.75 0.25 4-1/2" 4"
5.00 6.00 6.00 1.75 1.62 1.75 0.25 5" 4-1/8" to 4-1/2"
6 x 5 7.00 6.25 1.50 1.70 1.50 0.31 6" / 5" 6" / 4-1/8" to 4-1/2"
6.00 7.00 7.00 2.25 2.00 1.75 0.25 6" 6"
12.19 9.10 2.00 2.00 2.00 0.25 6" 6"
8.00 8.50 8.50 2.00 2.25 2.12 0.37 8" 8"
10.00 10.50 10.50 2.25 2.25 3.12 0.37 10" "Long" 10"